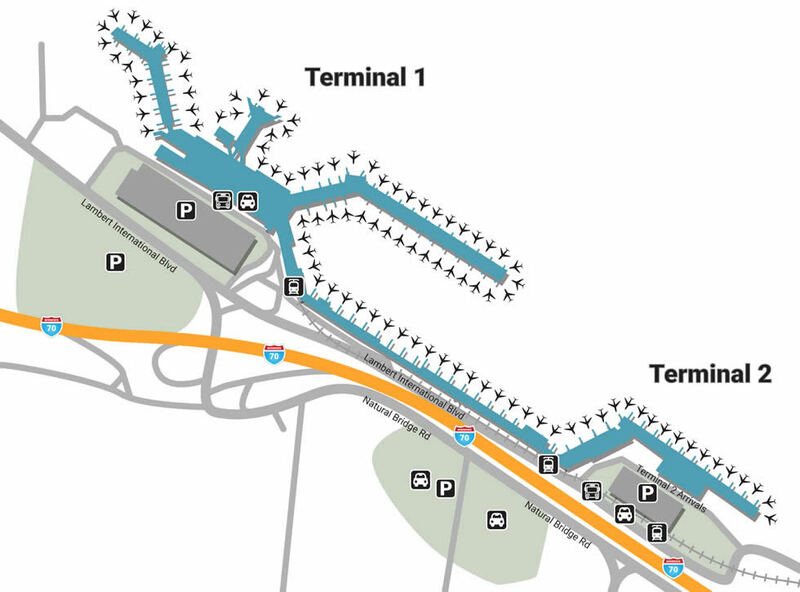 Visitors heading towards St. Louis International Airport can move around the airport with ease using our terminal maps. St. Louis is home to iconic wonders like the Gateway Arch as well as a strong sense of community that makes the historic Mississippi River metropolis a site worth seeing. As your first stop, The St. Louis Lambert International Airport is a great place to not only be greeted, but get to know the tastes and sounds of the city through unique terminal shops. Drop off your vehicle off like baggage before heading out, utilizing one of the seven parking locations. If you need to quickly pick someone up, stop by either of the Cell Phone Lots for free curbside waiting zones. The T1 Cell Phone Lot is located closest to terminal 1 while the T2 Cell Phone Lot is located right outside Terminal 2. Both Terminal 1 & Terminal 2 have connecting garages, which are respectively named Lot A (1) and Lot E (2). For the lowest daily rate, head to Lot C or Lot D, located a mile west of the airport on either side of Highway 70. Lot B offers daily parking and is located along Lambert International just west of Lot A. Nobody knows the beauty of St. Louis more than a local - allow them to show you the way in the form of guest services, whether it be the multi-lingual volunteers or the helpful staff located at each Information Desk. For busy mothers in need of a break, unwind at Children’s Play Port near Gate C3 or enjoy the quiet solitude of one of the on-site chapels (Gates E-33 & pre-security). The facility also offers special services, including relief areas for service pets (Gates E4, C24, A16), universal wheelchair accessibility, and visual paging. Get to know the local spirit by enjoying unique goods at the STL Airport, whether it’s local snacks and one-of-a-kind souvenirs from Discover St. Louis (Gate A6) or the iconic brand-merchandise from Ebony Magazine (C5). If you need something to make your outfit pop, go shopping for something extravagant down the way by stopping by LUXE (C15), an affordable elegance store that ties every look together. St. Louis is also a prideful big sports city, so whether you’re a Cardinals fan or a bloodthirsty rival, there’s something for everyone at St. Louis Sports (E14), about as much as Natalie’s Candy next-door. Feed your soul by feeding your body before you ascend, enjoying local drinks and fresh flavors that are worth seeking out. Get full before you pass through security by enjoying the baked goods and coffee at Brioche Doree (T1, Exit 6) or enjoy local wine and creative seasonal dishes next-door at Missouri Vineyards. If you’re stuck in delay purgatory, grab a gourmet burger & milkshake at Grounded in St. Louis (A9). Unwind at the end of the night with a local beer and Italian near Gate E6 by sitting down at the restaurant-bar combo, which includes 2 local favorites: The Pasta House Co. and Schlafly Brewery.